We've seen the Frontier version of the Samsung Gear S3 discounted several times already, but this time we find the Gear S3 Classic discounted down to $159.99 on Amazon. The unit on sale is the 46mm model and is marked as certified refurbished. However, products are rigorously tested to “look and work like new” and even includes a 90-day warranty. According to the listing, the refurbishing process includes "functionality testing, basic cleaning, inspection, and repackaging". Additionally, the seller is described to be one with a "high-performance bar." 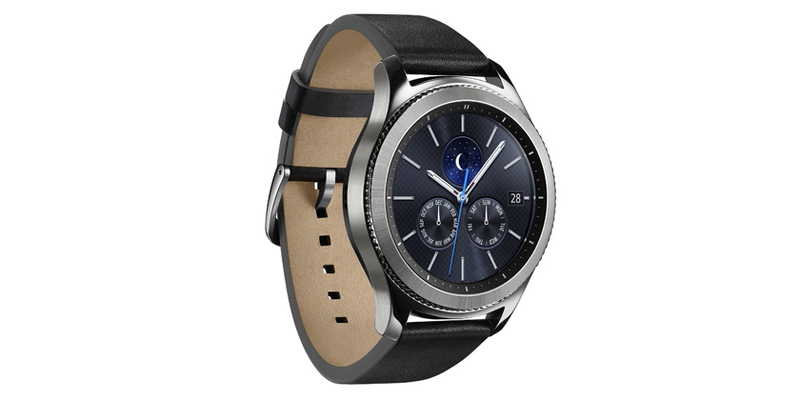 The Gear S3 Classic features a 1.3-inch AMOLED display with a 360x360 pixel resolution, 4GB of storage, built-in GPS, NFC and MST for Samsung Pay, and an Exynos 7270 chipset with 768MB of RAM. You get IP68 water and dust resistance, along with heart rate monitoring capabilities and other health tracking features. Compared to the Frontier model, the Classic version has a more elegant design, with a "classic" leather strap, and is slightly lighter by 59 grams. Besides that, it offers the same specifications and features as the Gear S3 Frontier. The fact that the Gear S3 Classic runs Tizen instead of Wear OS could result in you having fewer apps than you'd like, but if you are in the market for a classy looking wearable with all the basic functionality, you can't go wrong with this one.